Our Team - Hamilton Veterinary Clinic, P.C. We welcome you to browse our website: discover what services we have to offer, check out all the articles on pet care, and learn about the professionals who are dedicated to medical excellence and compassionate service for your pets. 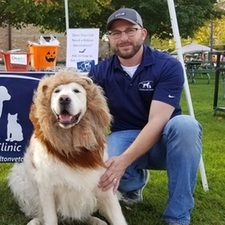 The doctors and staff at Hamilton Veterinary Clinic look forward to serving the West Michigan community residents and their pets. 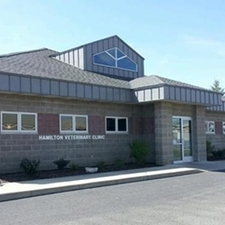 Dr. Tracy Nykamp started working at the Hamilton Vet Clinic in 1989, at the age of 13, as a kennel worker. During middle school and high school she worked almost every position at the clinic, which reinforced her decision to become a veterinarian. She completed both her undergraduate and graduate degrees with honors from Michigan State University. Her special interests are surgery and ultrasound. 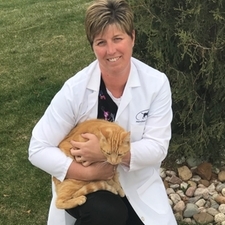 Dr. Nykamp purchased the clinic from Dr. Fred Chmielewski in 2012, and has enjoyed the new challenges and transition of becoming a practice owner while continuing to practice veterinary medicine. Dr. Nykamp and her husband, Scott, have two children, Tiernan and Breslin. She enjoys attending MSU sporting events with her family and coaching her children at recreational softball and baseball. She has one dog, a Creme Golden Retriever, named Dawson, and two cats, Blitz and Holden. 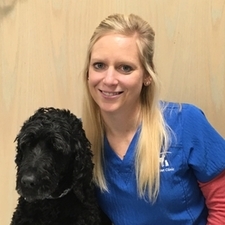 Dr. Julie Wesselink started working at Hamilton Vet Clinic in 2017. She attended Hope College and Grand Valley State University for undergraduate studies and Michigan State University CVM for her veterinary degree (Go Green!). Dr. Wesselink is really enjoying being a part of the Hamilton Veterinary Clinic family and transitioning to general practice after working at a small animal emergency practice previously. She appreciates the profession of veterinary medicine because of the variety of cases each day brings and because it allows her to help pets live healthy and happy lives together with their owners! Her veterinary medicine interests include ultrasonography, exploratory surgeries, and client education and communication. In her free time Dr. Wesselink's hobbies include playing guitar, kayaking, and wakeboarding. 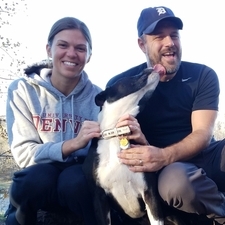 She and her husband Paul like to watch Detroit Tigers baseball games together and they have a dog and cat named for former Tigers players - a Pit Bull Terrier/Lab mix named Pudge (Rodriguez) and a Domestic Shorthair named Maggie (Ordonez). Dr. Wesselink has a Thoroughbred named Jester as well, and they practice dressage and jumping together. Abby attended both Baker College and Sanford Brown College. She graduated from Sanford Brown College in 2012, and happily joined our team in 2014. Abby met her husband at Silver Lake Sand Dunes. Abby and Randy have a son named Henry and have adopted two 4-legged children; a dog name Ceejay and a cat named Chuck. Abby enjoys spending time in the U.P. with her family, camping, fishing, and going on off-road adventures in their vehicles. 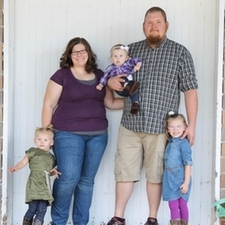 Amy graduated from Baker College in 2007 and joined our staff as a licensed technician. She has proven to be very valuable to our staff and clients as an educator. She is one of our surgery techs and a patient advocate. She is married to Ryan, and they have one son named Jace, a daughter named Emarie, and a Springer-Doodle named Charlie. Amy grew up riding and showing pleasure horses and POA's. She is hoping to have a horse again in the future. She enjoys spending time with her family and friends, camping, boating and hanging out at her parent's cottage on Silver Lake. Katelyn graduated from Baker College in 2012 and joined our staff as a licensed technician. She is married to her husband, Nick, and they have 3 beautiful daughters Zoey, Harper, and Madelyn. Her family has one cat named "Meow" (named by the kids). Katelyn knew she wanted to work with animals since she was a little girl. Katelyn loves being outside, cooking, and spending time with family. 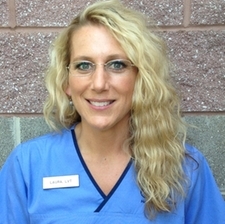 Laura graduated from Baker College in 2009 as a Licensed Veterinary Technician. 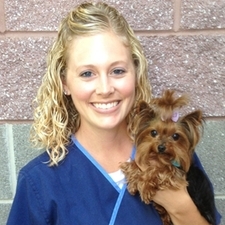 Working as an LVT, Laura has met many adorable pets and even more wonderful people. Laura has been married to her husband, Darren, for almost 20 years. They have been blessed with 3 wonderful children. Laura has a mutt named Nikki and a mutt named Maggie. Oh, and she has a rat named Daisy. Laura's love of animals has been passed down from her grandparents. She hopes to pass this passion down for generations to come because as she always says, "There is nothing like the unconditional love of a dog". Laura enjoys running, spending time with family and friends, being lazy by the pool or at the beach, attending her kids sporting events and theater performances. Val began working for our staff shortly after she graduated from Baker College in 2008. In addition to her role as licensed technician she has the added responsibility of managing our lab and surgical equipment. Her efficient manner and attention to detail helps keep everything running smoothly. Val and her husband Scott have a son, Paxton, and a daughter, Haven. They also have three pets: a cat named, Abigal No Tail, they adopted when she came to our clinic after being hit by car and abandoned. She had severe injuries and had to have her tail amputated. They also have Paisley, a 2.5 lbs Yorkshire terrier, who comes to work everyday with Val. Last, but not least, (so far) is another rescued cat named Willis. Val grew up showing cattle in 4-H and that is how she realized she wanted to be involved in the veterinary field. Her hobbies include spending time with family and friends, shopping and gardening. Georgia joined us in 2007 and has been a great addition to our staff. 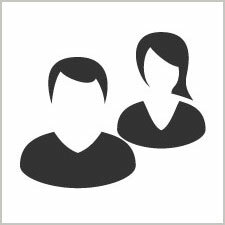 As one of our receptionists she always greets everyone with a friendly face and big smile. She is very efficient and has implemented a reminder call program. She enjoys being a part of a team and interacting with clients. She is a 1970 Hope College graduate. She and her husband of 40 years, Bud, have 3 children and 4 grandchildren. Georgia's hobbies include reading, cooking (especially for family get-togethers) and traveling. Their household includes, Max, a twelve year old black lab, who loves to go for walks and swimming in Lake Michigan. Dawn joined our team in January of 2017 after retiring from her previous employment as a school secretary. Dawn is enjoying meeting our patients and their owners. Dawn resides in Hamilton with her husband Dan and two grown daughters, Rachel and Lindsey. Her furry children include a Sheltie/Aussie mix named Abbie and a Golden Retriever named Duke. Dawn enjoys camping, traveling, walking and reading. Rich joined our team in March of 2012. He is married to his wife, Jenny, and together they have a son, Henrik, and a Golden Retriever, Champ. 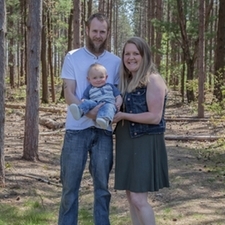 Rich attended college at Lake Superior State University where he received his degree in Business Administration. Rich enjoys spending time with his family, watching sports, and playing golf.